Today is the first day of voting on a $250 tuition increase for Kinesiology undergraduates. It’s not being called a tuition increase, but that’s what it amounts to: a new student fee which will be handed over in its entirety to the university. The fee is to fund a $5M loan towards the construction of a new kinesiology building, the Community Health Science Centre (CHSC). The CHSC will house the School of Kinesiology and the School of Nursing and is “envisioned as a leading knowledge centre in the field of sustainable community health” which “will address individual and collective teaching, learning, community engagement and research mandates in the fields of community health, healthcare and science.” In short, the CHSC is primarily an academic building, putting it in a different category from other buildings recently funded by student levy (AMS Student Nest, Engineering Student Centre, Arts Student Centre) all of which are dedicated student spaces. The scenario playing out in Kinesiology right now is very similar to what played out in 2010 when the Commerce Undergraduate Society held a vote on a $500 student fee to fund the construction of their faculty’s new building. It appears no one learned anything from that experience. Last week, things blew up when the Kinesiology Undergraduate Society (KUS) brought a motion to AMS Council asking them to approve a Memorandum of Understanding (MOU) about their upcoming referendum. The motion came as a surprise to most of council, having been added to the agenda the day of the meeting and the MOU was not circulated in advance, leaving people just a short recess to read and digest what they were being asked to agree to. The MOU outlined the conditions under which the KUS would run the referendum and what UBC’s obligations would be should the referendum succeed. This is unusual, since under normal circumstances there would be no reason for a student group running a referendum for a student fee to even talk with UBC about it, let alone draw up a document outlining their mutual obligations to each other. Drawing up an MOU would only make sense if fee in question was not a genuine student fee and was in reality a university fee. It’s fairly clear that’s the case here. A campaign called Make Your Mark (MYM), not the KUS, has been the driving force behind this referendum. 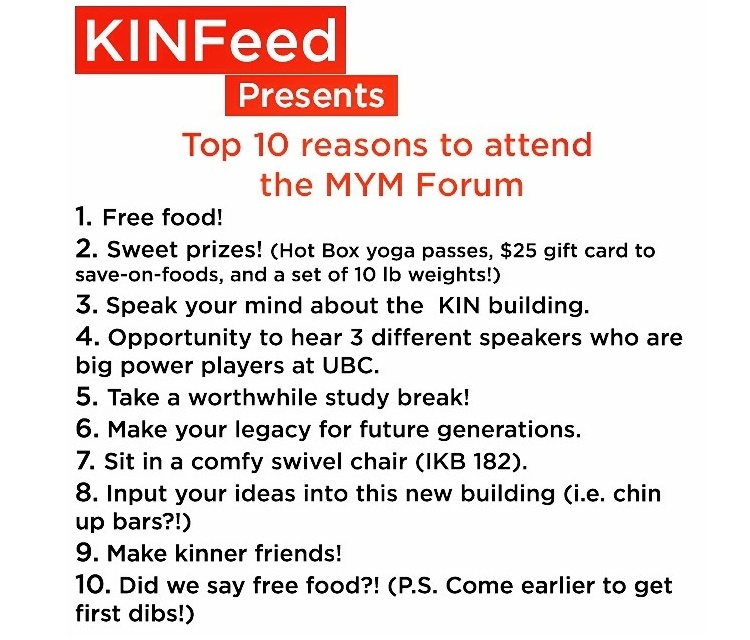 MYM is described as “a student led campaign to secure funding for a new Kinesiology building at UBC.” The person leading it is Robyn Freiheit, a fifth-year Kin student whose LinkedIn page says that in her role as Special Projects Coordinator for the School of Kinesiology, she is “Responsible for the creation and project management of the “Make Your Mark” informational campaign focused on the Community Health Science Centre (CHSC) building project.” In other words, she’s on the school’s payroll to push this project. KUS minutes from this year mention MYM only sparingly and from the few times it appears, it’s clear that the KUS is little more than a bystander while this campaign goes on all around them. When the KUS president was asked for more information about the building project and referendum, his response was to forward the inquiry to Freiheit. A similar scene went down at AMS Council in which Freiheit did all the talking while the KUS president sat at the table with little to say. There’s a lot that’s wrong with this picture: a constituency president who is unable/unwilling to talk about a referendum his organization is running, instead deferring to a paid employee of the school. If this referendum was being driven by the KUS, it’s hard to imagine why the fee would go towards the CHSC when for $5M – the same cost as the Engineering Student Centre – the KUS could build their own building! Do you believe in a thing called Kin manipulating its students? While MYM claims to be an informational campaign, it is light on information. Basic details about the overall scope of the building project or how the rest of the building will be funded have not been published anywhere obvious by MYM. In fairness, that may be because the building is still just an idea – it has not even entered the initial design stages – and if that’s the case, what exactly are students voting to support? MYM gets around that by being a social media campaign of boosterism focused on feel-good things like leaving a legacy, showing leadership, and getting access to things like a juice bar, KIN-only gym, and 24/7 study space. That’s a strong assertion to make about a project still in the conceptual stages in which the overall funding picture is unclear. The only profile of the CHSC project (which could easily be out of date) describes an $88M project of which $78M will come from government, $5M from UBC and $5M from donors. It certainly seems like the $83M from other sources will be what makes or breaks this project, not the $5M that might be generated from students. There is no legal contract in place about anything. Even if AMS Council had signed on to the MOU, it would not be legally binding in any way. An MOU is not the same as a contract, it’s better described as a Letter of Intent. Many of the promised benefits of the building are not backed up by anything concrete, which is not what these statements would lead you to believe. There are many ways in which UBC could wriggle its way out of any commitments in the future. Just five years on from its referendum, there are rumblings from the CUS that the university has failed to live up to its end of the bargain after they put their fee in place. There are other issues with this referendum as well, to do with the timing of the building, that only KIN undergrads are being asked to pay (but not grad students, and not nursing students) and that many promises and agreements seem to be done on a verbal basis. On the other hand, it is also true that Kinesiology is currently hindered by being spread out all over campus and has been searching quite a long time for a single building on campus in which it can consolidate. It’s hard to begrudge any admin or students who want a place to call home on campus. But bottom line, as student referendums go, this one is a sham. It’s being driven by the School of Kinesiology, using the KUS as a shell organization through which to institute the fee. Like the Sauder fee, it’s a back door tuition increase, and students in Kinesiology should think hard about why this referendum exists, how the fee got so large, whether they could get better value for that fee, and in whose interests it is to vote in favour of it. One difference here is that the faculty is running the Yes campaign, whereas the CUS endorsed the tuition increase in 2010. If you both write up the plan and finance the campaign, you can’t really claim it wasn’t your idea. Has anyone checked with the province on this, or asked the BoG if they agree with this as a mechanism for capital funding? Is anyone on the AMS paying attention to this? This would be a good time to step in and flex your mandate of supervising/ensuring properly run faculty referendums. I appreciate you taking the time out to attend ONE AMS meeting about this and digging into this matter for a whole WEEK. While you do make some valid points on the tuition increase and the effect it has on students you forget to take into account that Kinesiology students – such as myself – deserve a space on campus that is not shared, or office space for staff, or lab space for classes. We are a very small school compared to other entities on campus and we’re simply asking for an increase in tuition to be able to house us. This $250.00 comes with features that deliver tenfold of it’s price. You have only uncovered a small portion of what this building will offer to Kinesiology students. This building is in line with our priorities as Kinesiology students to grow and expand in our field. This referendum gives students a chance to speak up and say YES so that future students don’t have to fight for space in places like Woodward or Irving before a midterm to review with friends. This space gives us an opportunity to have lab equipment and lab space that can be up to date with the equipment we will be working with in the field. This space allows us access to a fitness facility WHICH WE REQUIRE in order to practice our learnings from the classroom. The unfortunate reality is that we can’t have our building funded unless we have students that shout to the top of their lungs with a referendum to show UBC how much we want and need us. AND UNFORTUNATELY, we won’t have as much Government support as some groups such as Pharmacy because the Government is just recently shifting their frame of mind from treatment to preventative care. Therefore, we as students must fund our own facilities for the most part. Now, because you’ve been so in depth with your research, you should also know that this project has been sought by many KUS executives in the past 4-5 years – only they were unable to execute it in the way that the Make Your Mark campaign was. The KUS this year is on board with what the MYM campaign is trying to accomplish and are working in conjunction with the MYM committee. To me, you’re implying that if the Undergraduate Society isn’t the one to take on the initiative of making something like this happen – no one should. Well someone did… a whole group of STUDENTS who wanted to this project to take off did. Additionally, I don’t think the Make Your Mark group has said no to any Kinesiology student who doesn’t want this project to consider starting their own campaign against it. In fact, any Kinesiology student who doesn’t see merit in this project should but considering it hasn’t happened, I would think a lot of students do see the benefit in this project. I would suggest chatting with Kinesiology students about how they feel about this project before speaking on it from the little information you have gathered. Sanaah, the new Engineering Student Centre cost $5 million total. What’s happening with your new building that’s going to cost ~15x that? Unlike the Engineering Student Centre this building is an academic hub on campus. It has a greater size and purpose than the Engineering Building. The gym that’s incorporated in the building plan itself is filled with very expensive equipment that will be useful for students in Kinesiology to practice what they learn. Along side that, there are amenities like lockers (400 to be precise) for commuter students who often have to bring a change of clothes to participate in labs and then go to meetings where they can’t dress in sweats. This centre also encorporates the price for new lab equipment which we are in desperate need for. This is meant to be academic as well as social therefore having more components to this building makes it of greater value and expense. I can assure any Kinesiology student that this building is going to be of benefit 10 times greater than its cost. Also, to address the tweet that the UBC insider posted about my previous comment. I find that you’re trying to target a student who is kindly trying to inform you about this campaign and correct your misconceptions. I really don’t appreciate you twisted my words and putting it out of context through one phrase. It saddens me to see students who are so eager to tell a story, that they don’t bother to collect all the facts and target others. I’d also like to add the fact that Neal and I have been in email contact and rather than replying to my strongly worded and informative email that corrects his misconceptions, he chooses to take to social media. Saanah, I’m not shying away from replying, it just seemed like something that would be better to do offline. You can always post the email exchange if you really want. I’m being accused of being uninformed and not doing my homework, but when I ask questions and raise points, I’ve been consistently getting push back and silence instead of answers. So if you think I’m uninformed, here are some questions for you to answer and we can all learn new things. 1) You say this campaign is directed at the government. How have Kin students lobbied the government in the past for a new building and what was the result? Is the government aware that this referendum is happening? 2) What is MYM’s role in this referendum? Are they a neutral information campaign or are they on the “yes” side? What resources has MYM received from the school? What role did MYM have in writing the question and conducting the vote? 3) Is there a copy of the Memorandum of Understanding available anywhere? 3. Fitness space (if it pertains to the KIN curriculum). Institutions also have incentives to build buildings for those purposes in the second list (e.g. heavy public emphasis on ‘student wellness’ these days), but a key reason student fees fund them is so students control the operations and functions of the buildings. Frequently, students have interests divergent than institutions, and control of building space operations allows these other interests to flourish. This is why students fund the New SUB. Lastly, there’s important policy/justice reasons that students with access to university that vote in a referendum don’t set the mandatory fee rates for students who have yet to be admitted. UBC knows this, but seems to not care in this instance, unfortunately. Also, from a pure strategy perspective, they’re still going to build the dang thing if you don’t give them $5M. They’ve promised the province they’ll build it, and $5M is chump change to UBC/the province. At least back in the day the CUS straight up instigated and supported their building fee increase. Yeah, they were tools campaigning for a terrible idea, but at least it was them. And some people, like Peter Rizov and others had the gumption to stand up against it from the inside. Here, it looks like the KUS is being manipulated into doing something, and they’re too inept to really realize it. But lets get back to basics: The very fact that students funding core academic buildings is bad. This phenomenon is the result of the dismal combination of a consumer mentality to education, a craven entitlement to “up to date” (ie. new and fancy) facilities, and lack of strategic politicking. Don’t be chumps guys. UVIC grad students had a referendum of this sort (a $55 per term fee to build a new gym) overturned because it was a violation of the BC fee cap. In that instance it was very clearly the university who ran an (unprecedented) referenda, so that may have had bearing on the Ministry’s decision. If I were the ministry I would be hard pressed to see this as completely run by students. Has the student association developed the plans for this facility (as they did with the SUB, for instance). Are students going to have governance control of this project (as they do with the AMS and student groups that receive referendum-based fees)? Does the student society’s right to levy fees as described in the University Act give a student organization the right to levy fees for the university to spend on capital projects? If so, can said student organization levy a fee for a building, and then decide to keep it for their own purposes via a second referenda? Student associations do set up referenda for associated organizations –such as PIRGs and student media — but the membership of these organizations is shared with the student association and students control those fees. In our case it is absolutely true that within a few months of the AVED decision to disallow the fee increase, the budget was approved for the new building. I think it is important for students to carefully consider what precedent they are setting by undermining the fee cap and their own autonomous governance with such a referendum. If students support the facility, why not actively support the university in their fundraising efforts? or, even better, lobby the BC government to reverse the massive cuts they have made to the funds provided to institutions to maintain and upgrade their capital assets.